Widex hearing aids are known to deliver the brightest, highest quality sound and emphasize what the wearer wants to hear rather than just amplifying all sounds. Background noise is one of the most common complaints from those who wear hearing aids. Widex hearing aids distinguish between conversations, outdoor blockers like wind and other background noise. Widex is a leading provider of technologically advanced hearing aids. Choose from over seven hearing aid models with features like wireless connectivity to smartphones and TVs. Widex hearing aids range in price from around $750 to $3,000 per hearing aid. Widex, the company we named as having the best sound in our guide to hearing aids, is a family-owned company founded in Denmark in 1956. Today, Widex is one of the largest manufacturers of hearing aids in the world, selling hearing aids in over 100 countries. Widex tends to be a leading innovator in hearing aid technology and design. Widex received the respected ID PRIZE design award in 1985 for the world’s first in-the-ear (ITE) hearing aid to produce the same high quality as the best behind-the-ear (BTE) hearing aid. In 1995, Widex introduced the world’s first fully digital ITE hearing aid. 2008 brought the company’s introduction of the world’s smallest receiver-in-canal (RIC) hearing aid. Widex introduced the first hearing aid designed specifically for babies in 2010. In 2018, Widex pioneered the world’s first real-time, machine learning, Artificial Intelligence (AI) technology in a hearing aid. Widex is carried by hearing aid centers and audiology doctors across the U.S.
Widex offers a wide variety of hearing aids for adults and children with both behind-the-ear (BTE) and in-the-ear (ITE) models. The price range for Widex hearing aids varies quite a bit due to the extensive model lines. Each model has multiple sub-models that differ in price due to the addition or subtraction of features and technology. The base price of Widex hearing aids varies from around $750 to $2,860 per unit. This cost is under or nearly in line with the average cost of $2,400 per hearing aid cited in a hearing loss and costs report presented to members of the President’s Council of Advisors on Science and Technology in 2015. The technology, level of hearing loss, rechargeable batteries and other factors affect the price of Widex hearing aids. for receiving technical updates to these hearing aids and controlling them. compared to any other rechargeable hearing aid on the market. at the theatre, Widex DREAM hearing aids offer richer and more detailed sound. to create a unique ITE hearing aid with a perfect fit. includes the smallest, most discreet ITE hearing aid. sound for those with severe to profound hearing loss. ZPower 2nd Generation This new model includes the sound technology from the EVOKE and adds ZPower’s second generation rechargeable system. It has the highest energy capacity of other hearing aid models using rechargeable 312 batteries resulting in improved long-term battery life. You can also replace ZPowered batteries with standard zinc air batteries at any time. ZPower parts come with an additional corrosion-resistant coating for all-weather use. Warranties on Widex hearing aids depend on the model you buy. Warranties start at one year for repairs and coverage for loss and damage, but most model warranties are for two to three years. Extended warranties are available to cover hearing aids for one or two additional years for $75 to $150, depending on the model. Widex hearing aid repair warranties protect the hearing aid, the charger and rechargeable battery door. Loss and damage coverage extends to hearing aids and not to rechargeable batteries, and there is a replacement fee that is a small fraction of the cost of replacing lost hearing aids. A Widex authorized dealer can explain your warranty options in detail. Widex hearing aids are available only through channels providing hearing diagnostics in person, offering help with fitting, selecting and maintaining the devices. If you buy Widex hearing aids online without the benefit of professional guidance these FDA-approved medical devices require, the warranty will be invalid. Use the “Shop Finder” or free trial link on the Widex website to find authorized hearing specialists in your area. We found several dependable hearing aid information websites listing Widex as one of the most reputable hearing aid brands. The Better Business Bureau opened a file on Widex USA in 1996 but with only one complaint filed over more than two decades, does not rate the company. Widex has a 2.7 out of 5 rating on ConsumerAffairs based on 34 reviews, but Widex resolved customer complaints and responded to negative reviews to help resolve issues. Many of the most recent consumer reviews rate the company at 4 or 5 out of 5 stars, and a customer took the time to go back and increase their rating after being happy with how Widex resolved a problem. ConsumerAdvocate.com rates the company 7.9 out of 10. How can I be sure I need a Widex hearing aid? According to the Hearing Loss Association of America, it takes the average person seven years from the time they think they have hearing loss until they seek treatment. You should have your hearing checked if you find yourself asking others to repeat themselves frequently, having trouble following conversations in groups, often turning up the TV or radio volume, or having difficulty hearing on the phone. Does insurance cover Widex hearing aids? As a general rule, Medicare Supplement policies and private health insurance companies may cover a portion of the costs of hearing aids. You should always check with your insurance company to determine if your policy has hearing aid benefits before making an appointment with a hearing specialist. Medicare Part B does not cover hearing exams, hearing aids or fittings but pays for diagnostic hearing and balance exams if your doctor orders them to determine if you need medical treatment. What are the Widex DEX accessories? 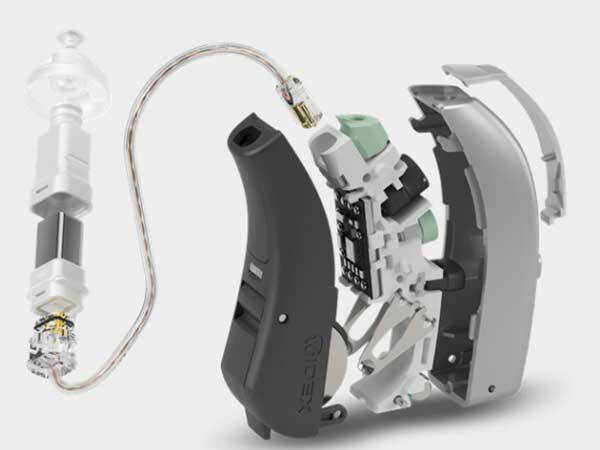 DEX accessories extend and enhance the features of Widex hearing aids. These accessories include PHONE-DEX (use with landline phones), TV-DEX (TV), FM+Dex (streaming audio), COM-DEX (mobile phones and Bluetooth devices) and CALL-Dex (discreet streaming from mobile phones), among others. The cost of DEX accessories range from $85 to $275, and all come with a one-year repair warranty. How do Widex hearing aids work? According to the National Institute on Deafness and Other Communication Disorders, all hearing aids have three parts. The device receives sound through a microphone, which converts the sound waves to electrical signals and sends them to an amplifier. The amplifier increases the power of the signals and then sends them to the ear through a speaker. Digital hearing aids such as those sold by Widex add a tiny but powerful microchip to process and select the sounds to amplify or push into the background. If I have problems with my Widex hearing aids, how do I get help? You can get assistance with your Widex hearing aids by contacting the authorized seller you purchased from or clicking on Service and Support on the Widex website. On the site, you can either fill out a form to get service from a nearby Widex partner or call the number listed for help with Bluetooth set up and mobile apps. Widex knows that hearing aids are not a one-size-fits-all product. Widex offers a great deal of helpful information about hearing loss and hearing aids on their website, but your audiologist or healthcare professional should ensure you get the hearing aids that work best for your lifestyle and level of hearing loss. Widex hearing aids are some of the best you can buy due to the company’s technology and years of development to serve those with hearing loss. These are my first hearing aids. They are OK but I don't notice much improvement in my overall hearing; except high pitch tiny sounds are much louder ( and annoying). My real complaint is the customer is locked into using a hearing aid dealer. The dealer I used only showed me Widex brands; I was not provided an opportunity to consider other brands. AND, I have to go back to the dealer to get supplies such as new rechargeable batteries. Widex does not list where those are available on their website. Overall I believe these will be the only pair of Widex I own. I have had hearing aids since 1990. From 1990 until 2017, I have had 2 pairs of Starkey hearing aids. I switched to Widex on the suggestion of my audiologists and I really wish I hadn’t. I have had these hearing aids in for repairs more in the last two years then I did for my two sets of Starkey. I just had my right one in on Friday because they were not working and had the microphone replaced. The hearing aid stopped working again on Sunday afternoon. As an experienced wearer of hearing aids, I would definitely NOT recommend Widex. On Monday, I will be bring the right one back in for repairs. For the record, my left one has been in numerous times because of static. Will be going back to Starkey for my next pair! The first Widex I had was the CIC and kept having a echo issue so I returned those for the Evoke. Now I am having issues with this annoying whistling. I can't wear them in the car because of the whistling and yes I have tried the transport, music, etc. and that still doesn't help. The HA is in my left ear and if sometimes if I raise my left arm the HA whistles. I basically cannot move my left arm otherwise the HA starts to whistle. I will be returning these and am going to try the Phonak B B90.